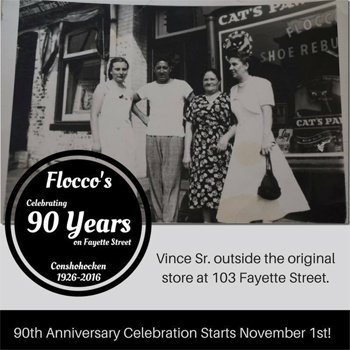 Family-owned and operated, Flocco’s has served Conshohocken, PA and the surrounding communities since 1926. We’ve all grown up working here at the store and we too feel the love and pride our father had for our business and for Conshohocken. We continue to live and work in this community and think our father would be proud of what this town has become. We carry a full line of men’s, women’s and children’s shoes, work shoes, school and team uniforms and have a huge selection of tuxedo rentals. Our specialty is hard-to-fit sizes and excellent customer service. Click Here for a chance to win our exciting 90th Anniversary Raffle!